Have you ever passed an Anthropologie storefront and stopped to think, how on earth did they turn those wine corks (or paper clips, spoons, pieces of reclaimed wood) into such works of art? Megan O’Connor, a visual designer whose resume includes creating window displays at Anthropologie, shares some of the answers. Spoiler: There’s a lot of creativity—and glue—involved. Married to a Google chef and mom to one-year-old Esmé, the confessed lover of all things French—from food to furniture—is now launching her own visual design company. I chatted with the Francophile to find out how motherhood has influenced her work and to get the scoop on how those famous Anthropologie windows come together. Tell us about the work you do as a designer. I do a mix of installation, fabrication—which is making things from scratch—and event space design. People often hire me to refinish furniture or create spaces. Right now I’m focusing on children’s spaces, like nurseries and playrooms. I went to the Fashion Institute of Design and Merchandising in San Francisco and studied visual communications. I was obsessed with Anthropologie and used to walk by the windows and be like, that’s what I want to do! I got an internship at Anthropologie as a visual intern, working alongside the display coordinator. In the beginning, it was a lot of grunt work, like hot glueing the same thing for hours on end. We made a deer out of wire that was 10-feet tall by 30-feet wide. Then we knit a sweater for the deer. It was hours and hours of hand-knitting. It was very tedious, but I learned how to fabricate and build something from the ground up. I loved it! The windows at Anthropologie are always so creative. Can you tell us more about what goes into the process? You have free reign to an extent. For the windows, we’d get a packet from corporate with an idea and a materials list. A lot of times they’d give us a story: “This is for the girl who wants to go on a safari but still look cute.” And the materials might be palette wood, spoons, and paper clips. And then it’s like, how do I create an elephant out of spoons? One time we got a whole story based on an imaginary Russian girl named Kalinka. To inspire us, they even went so far as to tell us the kind of music she listens to. There’s so much to the store. It’s not just clothing—it’s a lifestyle. 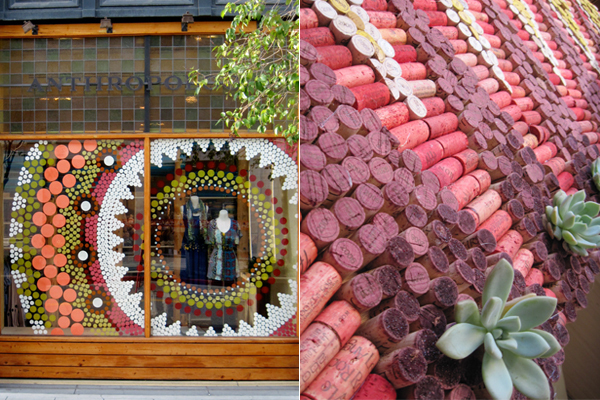 What’s one of the most memorable window displays you created? One time we created huge geometric shapes to hang in the windows. The guidelines were warm colors, wine corks, and succulents. We collected wine corks and spent hours dip-dying them and glue-gunning them onto the shapes. I always knew I wanted to get my own side thing going. When I got pregnant, I decided I wanted to be able to stay home with my daughter. Now that she’s a year old, I feel like I can actually branch out more and run with my business venture. The first year of motherhood felt like I was holding my breath, but now I’m feeling really good about having an entire day of meetings. How has your daughter influenced your design aesthetic? There’s more of a sense of whimsy. Things have taken a lighter tone, even in adult design, since I see my life through my daughter’s eyes now. Other things have become a little more feminine, too. I never anticipated this–I’ve always been an on-and-off tomboy–but when I found out I was having a girl, I just went feminine. 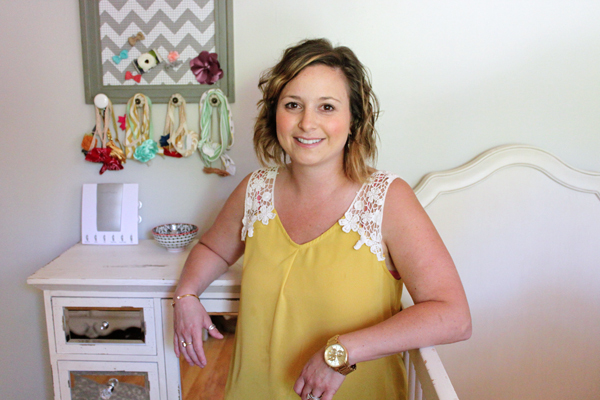 I decorated her nursery with ruffled pink curtains and vintage French furniture that I refinished in soft whites and greys. 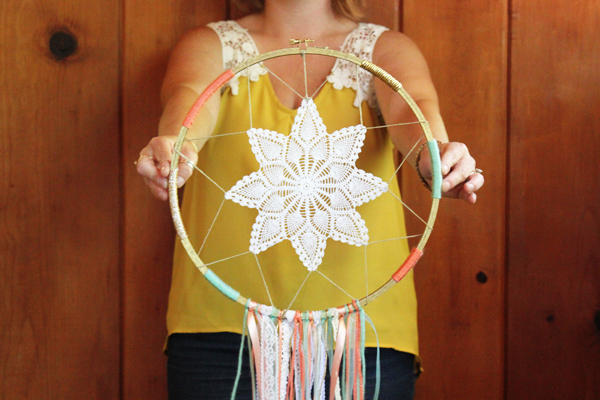 Lately I’ve been designing dream catchers for nurseries and playrooms using woven vintage doilies. 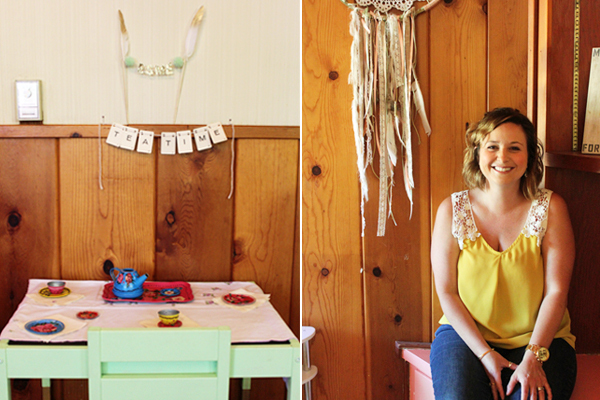 There’s a clear French theme going on in your life, from your daughter’s name to her nursery. Why French? I get this question a lot! People are always like, “Are you French? Why is her name French?” My husband is a classically trained French chef, and I love French vintage design. I’m really into the shabby chic look. The theme of our wedding was “La Vie en Rose.” It’s a very classic French love song. That was the theme for our love, so it was fun to continue that in our daughter’s room. 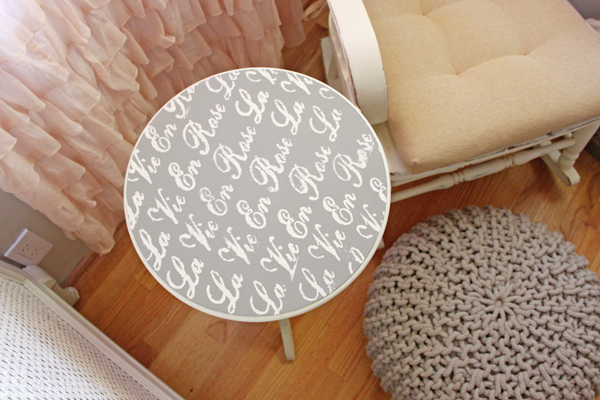 I hand-painted the song onto a side table. What it’s like being married to a chef? Awesome! Like any job, it has its positives and negatives. His schedule is all over the map, but I love it. It’s so fun to have people over and host dinners, especially with having a baby. You can’t just up and go places to meet friends for dinner, so we have people come over and make dinner here. Almost everything I own is from Anthropologie—the discount helped. It’s sort of its own style, right? I’d say eclectic. I really like accessories, like big statement necklaces, and pieces with fun touches, like lace or doilies. I pretty much live in yoga pants because I’m usually covered in avocado by noon. A lot of my Anthro stuff is dry-clean only, so I can’t wear that as much on the day-to-day. Do you have any advice for women who are interested in a career in visual design? It’s a very physical job. Expect your days to be less about sitting at a desk and more about using power tools, being covered in paint, wearing a tool belt, lifting heavy objects, and being on very tall ladders. Though a lot of my inspiration is parallel to and inspired by fashion trends, it’s not a glamorous job. My most successful projects were inspired by everyday things and nature. Find your inspiration in simple things and work from there. 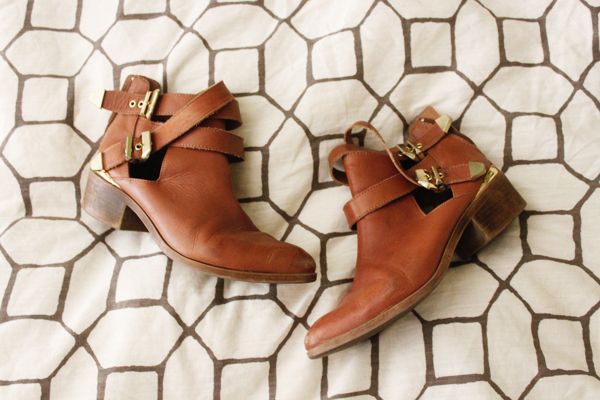 A pair of brown booties that I got at—surprise—Anthro. They’re by Seychelles and have cute little clips on the side. I should have bought ten pairs because I wear them all the time. P.S. 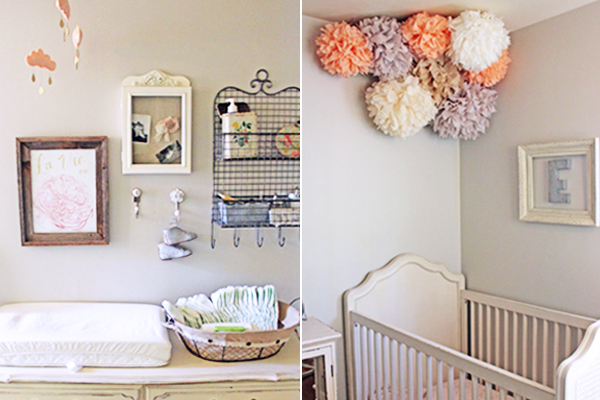 You can see more of Esmé’s beautiful nursery on 100 Layer Cake-let. Megan is so talented! Her creativity at Anthropologie to her home is inspiring. I agree! I want to live in her home! Thanks for reading!